The Vermont Project for rehabilitation of chronic schizophrenic patients reports an unusual degree of success. The nature of its program , its operation, and the factors involved in its success are presented. Emphasis is placed on the need for “faith, hope and love” in such an undertaking. Donald M. Eldred, A.M., George W. Brooks, M.D., William N. Deane, Ph.D., and Marjorie B. Taylor, A.B. It is customary to present the results of a program or research project after first describing what has been done. However it seems likely that at least one of the reasons why we were asked to present this paper is the results which have been obtained in our rehabilitation of the hospitalized mentally ill. Therefore it seems reasonable to discuss the results first. The results of our program are perhaps better shown by the graphs in this paper than by using many words. However a few summary facts may supplement the picture presented by the graphs. 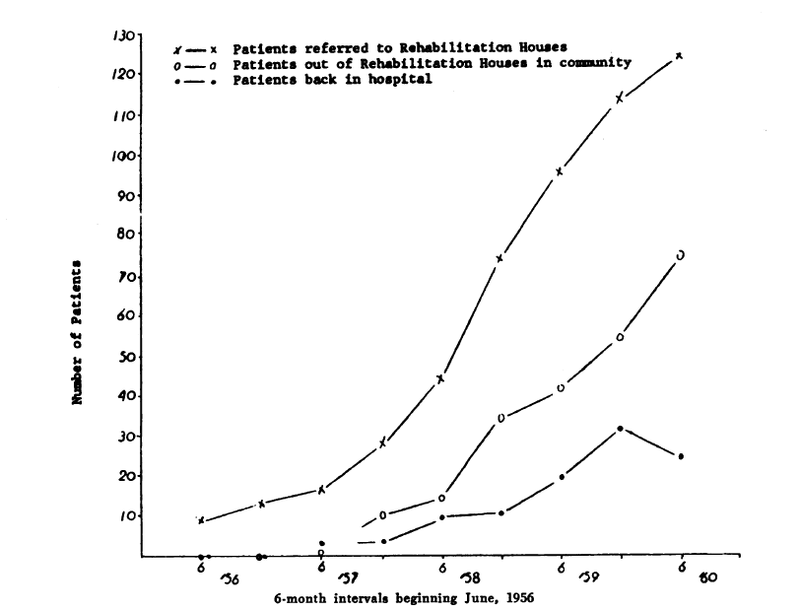 Between January 1, 1955 (when we first began our program) and August 15, 1960,367 patients had been referred to the rehabilitation program. As of August 15, 1960, 255 (70 percent) had been released. Of those released, 58 per cent have never returned to the hospital, and of those who did return 58 per cent were subsequently re-released. 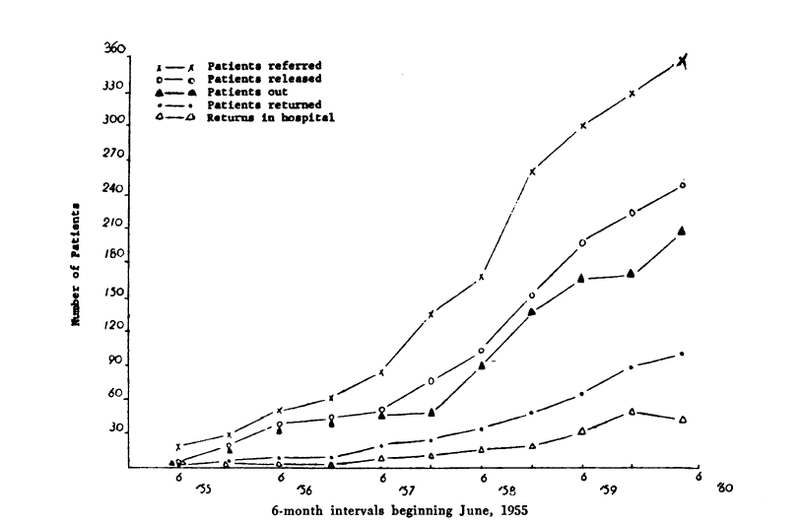 Putting those two sets of figures together we have 211 or 57 percent of these 367 patients who were out of the hospital on August 15, 1960. Of these 8.3 went first to one of the Rehab Houses, and 128 returned to the community directly. We have completed IBM processing of data on the first 251 patients referred, and these data show that the average length of time from becoming disabled until referral to the project is 9 years 11 months. 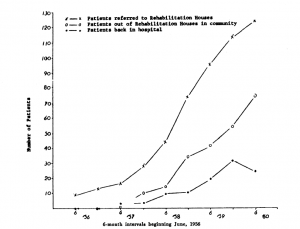 The range of time for the last hospitalization is from 2 months to 35 years 5 months, and the median is 6 years 10 months. Seventy-one of the patients had been hospitalized continuously for more than 10 years. The average age at time of referral is 38 years 4 months for men and 41 years 7 months for women. Both the mean and median education is essentially 9 years, and 209 of the 253 patients are single, divorced, separated, or widowed . These data are presented to show that we have been working largely with patients who a few years ago would have been considered hopeless. Moreover, most of the patients who have been released are in productive work and self supporting. We believe, then, that these data indicate conclusively that chronic hospitalized mental patients can be returned to productive lives in the community. In narrating the Vermont story one has to begin with names, including the authors of this paper. In 1944 Rupert A. Chittick, M .D., became the superintendent of the Vermont State Hospital and began building a staff and program and laying the foundation for a therapeutic community in the hospital. At about the same time, Francis S. Irons became the director of the Vermont Vocational Rehabilitation Division and began expanding this division’s program in a way that permitted the work that was to come later. In 1947 George W.Brooks,M.D.,who has been the director of the Rehabilitation Project which we are discussing, joined the staff of the Vermont State Hospital and began experiences and programs which have played an important part in our project. In January, 1948, Donald M. Eldred, who had been with the Vocational Rehabilitation Division for a little more than six years, became the head of the newly organized Psychology Department at the hospital. During these years Marjorie B.Taylor was a counselor and later supervisor of case services, training counselor for the Rehabilitation Division, and was acquiring experience with the emotionally handicapped clients of the division. Thus a number of the people who have been key figures in our project had been working together and laying foundations for several years before the project began. In September, 1954, the hospital began extensive use of the ataractic drugs which made large numbers of patients accessible for therapy who had been inaccessible hitherto. 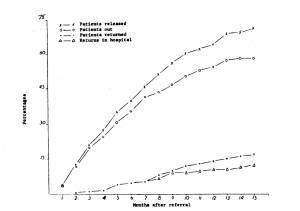 In January, 1955, the hospital’s psychologist began group therapy with about a dozen such pa· tients who had been considered virtually hopeless and whose medication had improved their condition but not sufficiently to permit release. Because of the psychologist’s previous experience with vocational rehabilitation, the director, Mr. Irons, was invited to meet with the group and to explain what assistance this agency could provide for these patients when they should leave the hospital. This led to regular visits by Mr. Irons and later Mrs. Taylor during which plans were made for the vocational rehabilitation of these patients. Much to our surprise almost all of this group left the hospital and were employed before the end of 1955. The 1955 Vermont General Assembly had authorized a commission to be appointed by the governor to study the need for half-way houses in Vermont. Mr. Eldred was one of the members of this commission. Early in the work of this commission he talked with Mr.Irons about the need for a place where patients who had no home, or at least no suitable home to go to, could live during the first months of release from the hospital. From that conversation the idea of rehabilitation houses was born. The idea was discussed with hospital and vocational rehabilitation officials,including Vlad Ratay who was then the OVR regional representative for New England. All of these people, as well as OVR officials in Washington, approved the idea, and the first Rehabilitation House was opened in May,1956,by the Vocational Rehabilitation Division. 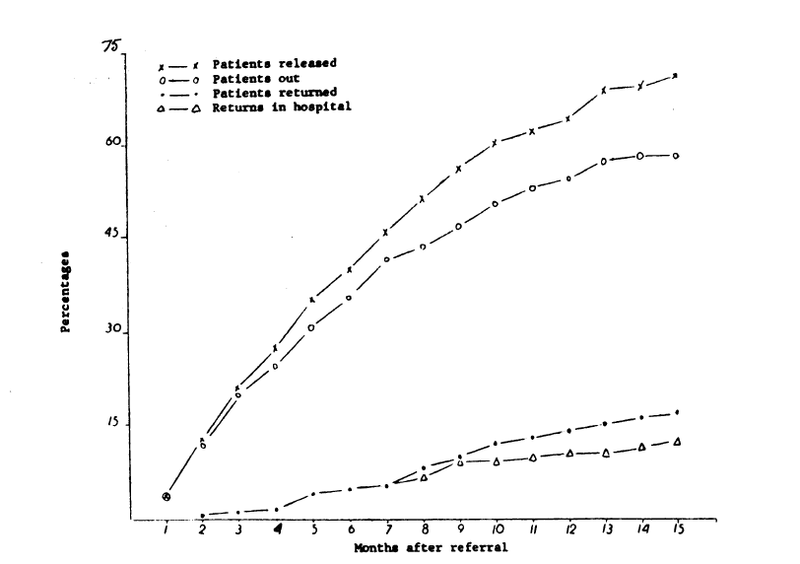 Continued success with additional groups of patients led to the idea of a research project by the Vermont State Hospital to determine how far such a program could be extended and the effect which expanding such a program would have upon the rehabilitation of larger numbers of even more chronic and hopeless patients. The request for funds for such a project was approved and became special project No.180. * The project began officially on July 1, 1957,and ended officially on June 30of 1960,* though the program continues virtually unchanged . *Office of Vocational Rehabilitation Special Project No.180. *Chittick, R. A.; Brooks, G. W.; Irons, F.S. ; and Deane, W.N. The Vermont Story. In describing our program there are ten aspects which should be discussed. One aspect has been the continued use of ataractic drugs both while patients are in the hospital and, for a majority of patients,after they have been released. A second aspect has been group therapy. Earlier we mentioned the first group which was continued for six months in the hospital and for another six months after the patients moved to the Rehab House.There were four more such groups in the hospital before the research project began in July, 1957. Since then the group therapy program has been expanded, and we now have seven different groups. One of these groups is made up entirely of patients who have been released but who have had to return to the hospital for further assistance and meetings with the rehabilitation counselor who has been working with them since they were referred to the project. Two groups include a few of these as well as patients who are about ready to leave the hospital and who need orientation to community services, agencies, and the like. Three groups are composed of both sexes and conducted by co-therapists. In these three groups the emphasis is largely on socialization and activity, including trips to stores and other places of interest in the community. The adolescent patients in our hospital high school*(National Institute of Mental Health, Special Project Grant OM-372.) have frequent group therapy sessions; indeed the entire school program is essentially a form of group therapy. During our first group therapy activity it seemed desirable to have the patients live on the same ward in order that discussions might he continued between group therapy sessions and in order that the patients might develop more group feeling. A third aspect of our program has been the expansion of this idea to the point where we now have four rehabilitation wards of about 30 beds each, two for men and two for women.These are open wards,and ward life is made as attractive as possible. Among other things the wards have been thoroughly renovated and made physically attractive and as homelike as possible. The attendants on these wards have frequent conferences with the project professional staff and are included in all discussions and decisions affecting the patients. Fourth, in a further effort to promote group feeling and cohesiveness, occupational therapy and recreational therapy have been planned for these patients as groups. In occupational therapy, es­pecially, a carefully planned graded program of activities is aimed toward encouraging the patients to become mutually concerned with each other and with group activities. A further aim is that of providing opportunities for learning fundamental skills needed for life in the community. Recreational therapy is planned to promote socialization in the hospital and the ability and liking for participation in social events in the community. A fifth aspect of our program is intended to help the patients build bridges between the hospital and the community. To this end there is a system of graded privileges beginning with the open rehabilitation wards and ground privileges and extending to town privileges. The local Knights of Columbus opens its club rooms each Saturday afternoon, and a large number of patients have a lively and enjoyable time there with activities and refreshments handled by the patients. The Knights of Columbus provide seven dollars a week to cover the expense of refreshments. In addi­tion, now they have a fund to pay for things needed by patients which cannot be paid for by families or by the state. At the moment the Knights of Columbus are planning additional activities and services for our patients. Another phase of this “bridge building” comprises parties at the Rehab Houses to which rehab patients in the hospital are invited, and parties at the hospital to which former patients who are now in Rehab Houses are invited, as well as other interested people in­cluding the governor. In addition, patients who seem likely to go to one of the Rehab Houses spend several weekends there before release from the hospital in order to become oriented to this new situation, become acquainted with the other people living there, and find out for themselves what life in a Rehab House is like. A group of former patients has organized the Helping Hands, and this group, which is growing constantly, visits patients in the hospital to tell of their experiences in the community and to offer the benefit of these experiences and whatever other assistance they can to those who are contemplating leaving the hospital. The Helping Hands also hold meetings regularly, and former patients who have returned to the community are urged to attend. The group has expanded to form a second chapter so that at present two Rehab Houses 40 miles apart serve as the nucleus and meeting place for these chapters. A quarterly mimeographed publication is put out through the mutual efforts of the two chapters supplemented by contributions from patients in the hospital rehab wards. A sixth factor which also serves as a further bridge is found in industrial therapy and the employment of patients in the local community. We have always had a high proportion of our hospital population working, hut too often the work done was for the convenience of the hospital. Now work is planned in accordance with the patient’s post-hospital plans. The employment of an in­ dustrial therapy supervisor facilitates this, as in many hospitals, and he has charge of the part-time or full-time employment of patients in our local community, a sort of “quarter-way house” program. Ratings are made monthly by community employers as well as hospital work supervisors, and these reports are compared with those made by hospital personnel who see the patient in other capacities. Still another form of “bridge-building” has been a series of meetings planned by Dr. Deane, the project sociologist, and devoted to lectures by hospital personnel and various people from the community,listening to music, putting on mental health plays, discussion of current events,and even a series of sessions devoted to sociology and another on problems of our times. So far little has been said about the activities of the Vocational Rehabilitation Division, hut these activities are a most important aspect of our program. Mention has been made of the counseling carried on with patients in the hospital by two counselors from the Rehab Division. Counseling begins as soon as the patient is ready after being accepted by the project and continues when the patient leaves the hospital for a job in the community or to go to one of the Rehabilitation Houses. These houses,of which there are now three,located from 12 to 25 miles from the hospital, are operated by the Vocational Rehabilitation Division. Every attempt has been made to make these as homelike as possible. Each house has a capacity for a relatively small number of patients; 12 is considered the maximum. The people who manage the day-to-day operation of the houses are called house parents and are chosen for their ability to function as parents. Thus we have in essence three large homes with father and mother and from 10 to 12 children and a room or two available for “visitors.”The rehab counselor continues close contact with pa­ tients in these houses and after they have left, and the problems dealt with are too numerous to mention. Dr. Brooks visits a Rehab House in each of two urban areas (40 miles apart) every other week for an evening. House clients and ex-patients living in that area are seen in consultation as problems arise. Dr. Deane accompanies him to spend an evening with the group at the Rehab House. Perhaps the importance of these activities of the Vo­ cational Rehabilitation Division can best be stated by saying that we believe they provide a reason for patients to get well and to leave the hospital, whereas before there was no reason for many patients to make any effort to get better. They would have had to he more out of contact with reality than they were to want to exchange the security and comfort of the hospital for joblessness and no suitable place to live in the community. The ninth aspect and by no means the least, is our progress in becoming a therapeutic community. In our hospital the philosophy is that anyone may establish a therapeutic relationship with patients.Attendants and other employees now have a therapeutic attitude instead of the previous custodial attitude. They are imbued with optimism about the patients and are convinced that they can and are contributing much to the recovery of the patients. One cannot overemphasize the importance of this change of attitude. A concomitant of this is democracy within the staff, and every person’s opinion is valued and his ability utilized.Many hours are spent in conferences between professional members of the staff, attendants, and work supervisors. Such a philosophy and working relationship provide many more opportunities for interpersonal relationships for the patients with all the inherent advantagps of this. After all, one of the primary reasons for the illness of most of the patients referred to the project is unsatisfactory and painful interpersonal relationships, and these people have to learn to trust and live with the rest of the human race and to believe that other people like and respect them. In a therapeutic community, too, the members have an opportunity for self-expression. Patient-staff conferences facilitate this. A final aspect of our therapeutic community is the mutual understanding of hospital and rehabilitation personnel. This was facilitated in the beginning by the relationship and activities of some of the key figures when this program was starting, but it has grown and developed because of mutual respect and the democratic atmosphere of a therapeutic community. Undoubtedly you have been impressed with the fact that nothing about the Vermont story is unique. What, then, is responsible for an unusual degree of success? Actually, we are not sure that we know the answer to this question. Possibly one answer is that we have combined a number of factors, none of which is unique in itself, but the combination is unique. We feel certain that our team approach has been a very important reason for our success. We do not claim that our hospital team and therapeutic community are unique. We are not even sure that the close understanding and teamwork of hospital and rehabilitation personnel is unique, though we are sure of the importance of teamwork.We have learned that if there are differences and friction among those who are working with patients, the patients suffer, and their recovery is retarded and limited. Possibly our unbounded optimism and blissful ignorance of potential errors and mistakes have played a part in our success. Similarly our firm conviction expressed openly to the patients that we believe they can recover and our pledge of commitment of ourselves to help them do this have unquestionably been important factors. Perhaps we can best summarize our present thinking about the reasons for our success by starting with the foundations which were laid over nearly a decade by both hospital and rehabilitation personnel and which provided a climate favorable for the development and success of such a program. Then we add the ataractic drugs which, as Dr. Brooks has put it, have dried out the soggy patient material and made it combustible. Next came faith, or shall we say vision and daring on the part of the hospital and rehabilitation staffs, faith that these people could be returned to productive lives in the community. Faith 1s contagious and the patients caught it. Moreover, they have been reluctant to fail those who had faith in them. Constant reassurance and the success with the first patients followed hy continued success nourished this faith and made it stronger. And then there was hope. For the first time many patients had reason to hope that there was a place for them in the community once they were well. They now had an opportunity to walk out of the hospital with faces turned to the future instead of backing out of the hospital as in the past. Finally, there is faith, hope, and love, and “the greatest of these is love.” If we define love as interest in a person and his happiness, an interest so great that his happiness is more important than our own and our happiness comes from his, then indeed the “greatest is love.” We believe that most of the pa­ tients with whom we have been working are ill because they have not found the right sort of love from their families and other people. Hence they have withdrawn. If they are to return to live with others in the world outside the hospital, they must dare to believe in others once more. In the commitment of some member of the hospital staff or of a rehabilitation counselor or a Rehab House parent to the recovery and return to productive living of a patient, the patient has the first demonstration of the love which gives him faith and hope. They in turn enable him to dare to make a return commitment, first to one or two individuals and gradually to others until he is once more able to live comfortably with himself and with others. In conclusion, then, it is our belief that together the various aspects of our program have provided our patients with faith, hope, and love and that this is the essence of our success. Mr.Eldred, Dr.Brooks.and Dr.Deane are affiliated with the Vermont State Hospital, Waterbury, Vt. Mrs. Taylor is affiliated with the State Department of Education,Montpelier,Vt. This paper was presented before a Joint Session of the National Association for Retarded Children,the National Rehabilitation Association,and the Medical Care, Mental Health, and Occupational Health Sections of the American Public Health Association at the Eighty-Eighth Annual Meeting in San Francisco,Calif., November 3,1960.